Why have I started the blog? Well, it’s been a long awaited blog. I have been asked countless times if I have a blog, for everyone is blogging! I didn’t feel at the time I had the time or effort to put into a blog. However, over the last few months circumstances have changed which means I can now dedicate more time to blogging. WWMS was partly born because I want to log a part of my time. The way my teenage diaries had of that part of my life, but in a more logical, coherent (and perhaps public) way – but without the stroppiness! 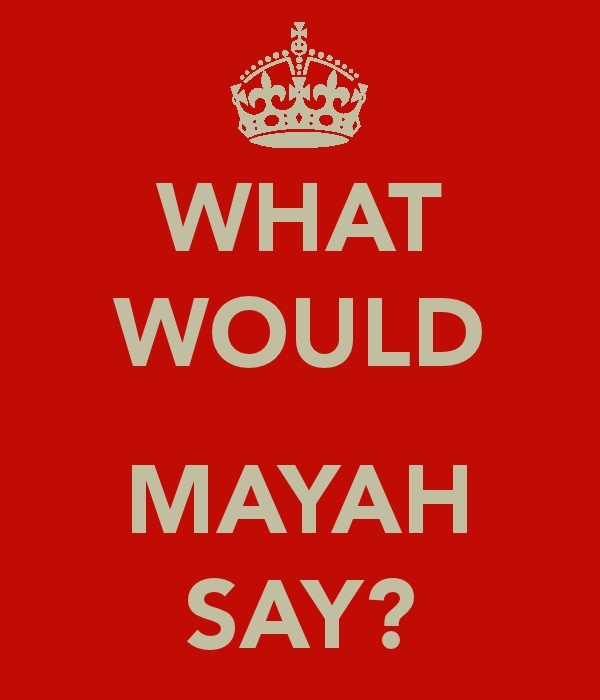 Why have I named it ‘What Would Mayah Say?’ I needed a name for it, I didn’t want to have an alias, because it just didn’t feel right for me. So, upon trying to think of a name, I came across this poster which I have in the office – in a tongue and cheek way! So naturally, I have decided to name it after the poster. The blog will cover my everyday life, the things I buy, what I think, where I go etc. It’s an inside into my life, without it being too personal – that just wouldn’t be fair to those around me. I am happy to liaise with PR’s and companies about products and events being featured on WWMS, however, it needs to fit into what the blog is about. To keep in line with what the blog is about, I will not blog about things I don’t like, don’t attend or do not believe in. If you’re unsure what the blog is about, please have a read of previous posts and then feel free to contact me via the contact page.